Broiled, grilled, sautéed, or even just left raw—I'm doing it all and trust me, you're going to want to be doing it too for a sweet little all-natural detox treat. The beauty in grapefruit is that they're packed with nutrients and body beauty goodness that'll keep you buying them in bulk! 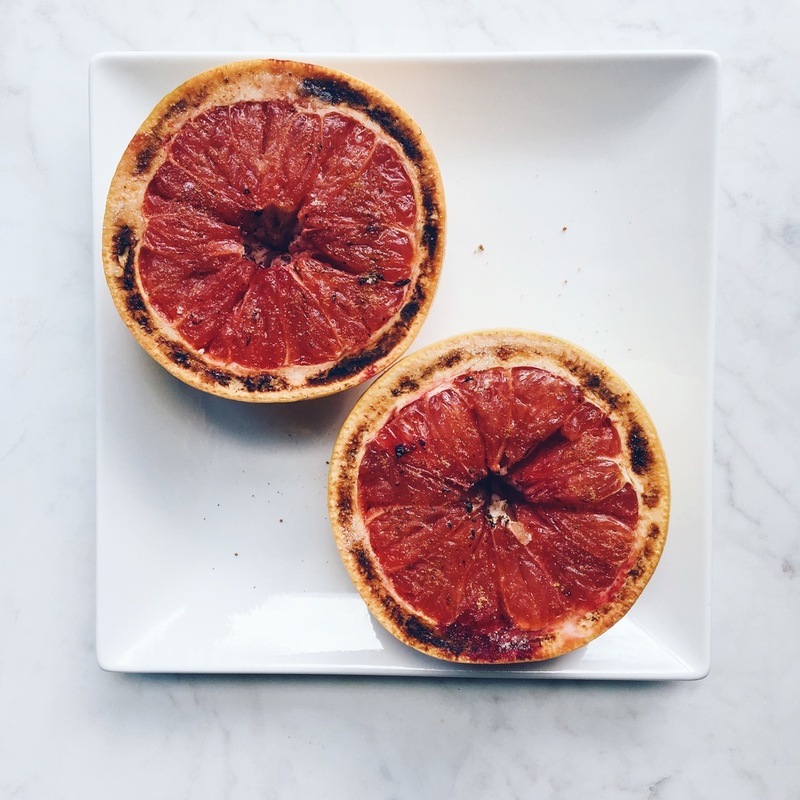 We're always hearing about grapefruits and how they're an awesome, all-natural, powerful cleansing food that aids in liver detoxification and has the ability to help in weight loss as well as boost up your metabolism too—they're the BOMB.com, #facts. Naturally high in vitamin C, pink and red grapefruits contain lycopene, a powerful antioxidant, that will protect your skin from UV damage—which is super SUPER amazing and significant supporting anti-aging all year round. Flavonoids, a plant-based compound rich in antioxidant properties, are found in grapefruits that offer your body anti-inflammatory benefits as well as phenomenally improving blood vessel function + encouraging optimal blood flow throughout your body especially to your skin, nails, and scalp. Instead of smothering all of these health benefits with refined sugar, today I'm broiling these babes with a naturally sweet topping to balance out the citrusy "tart" sourness of the grapefruit. Broiling naturally creates a caramelization factor with any type of food + only takes a few minutes to cook up! Preheat your oven broiler to low. Line a sheet try with parchment and set aside. Cut a slice off of the top and bottom of the grapefruit in order to create a flat surface to allow the fruit to lay on while in the oven. Cut the grapefruit in half and place on sheet tray. Drizzle honey and sprinkle the cinnamon on top of each half. Place the grapefruit under the broiler, just about 5-inches away from the heat source and broil until the honey starts to uniformly bubble. ~5 minutes. Remove from oven. Transfer each grapefruit half onto an dish and garnish with a mint leaves.